Learning by doing – we are many who consider actually doing things is the best way to learn. That was my starting point when I wrote my latest book, SharePoint Online Exercises. I have been a SharePoint teacher for many years, and I have often given my students practical problems to solve. I might for example ask them to create a phone messages app that receptionists could use instead of handing out yellow post-it notes to people who had been unavailable. After an introduction the students tried themselves, and to their help they had suggestions with step-by-step instructions. Working this way, the students did not only learn how to create a phone messages app for SharePoint. That was not even the primary goal! The purpose of the exercise was instead to let the students try many useful SharePoint features and techniques in the process of solving the exercise. It was when I saw how much my students appreciated the step by step instructions that I decided to create SharePoint Online Exercises. Among all exercises I have chosen twelve, which together cover many important SharePoint areas. I had good help from my mother Kate and from kalmstrom.com General Manager Rituka Rimza. As usual our Lead QA Vijayant Rimza created the book cover. We adapted the exercises for SharePoint Online, as Microsoft's cloud platform is becoming increasingly popular, but I hope students with on-premise editions of SharePoint will also find them useful. Each exercise in SharePoint Online Exercises has a link to a kalmstrom.com Tips article with a video demonstration. In the demonstration I show a similar project as the one described in the step by step instruction, which gives another dimension to the exercise. My earlier SharePoint book, SharePoint Online from Scratch, give a more thorough and detailed description of Office 365 SharePoint, and it has a careful progression from easy to complicated. SharePoint Online Exercises does not have the same dept, but if you study both books you will have a more varied learning process. Both books are sold at Amazon, just like my first book, Excel 2016 from Scratch, and all three are available as both e-book and paperback and included in the Kindle Matchbook program. On the kalmstrom.com website you can see presentations of all three books and also have previews of the Kindle versions. 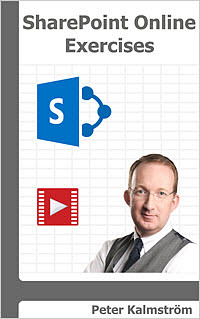 I like recording demos and writing books, so SharePoint Online Exercises will not be my last one!